Tennis is a very popular individual game among all sports. It is greatly connected with fashion and display of style. Exclusive tennis apparel and tennis shoes are used for extreme comfort and ease of movement by the players. The players get that firmness and grip on courts with the best tennis shoes. That is the reason for the shoe is an integral part for every tennis players performance enc. The leading brands of tennis apparel provide many versions of tennis shoes. Special model shoes designed for clay courts, grass courts and synthetic courts separately. Tennis shoes that famous players use sometimes are released with their names or initials on it. Shoes give more confidence for players to run, stretch and move. For tennis, shoes are made to focus on lateral movement for extensive stability. Unexpected sprains and ankle injuries could be avoided when tennis players use quality shoes. Tennis shoes have shock absorption materials and cushioning that protect your feet. Different shoes are made to suit the ergonomics of men and women in the USA. An ideal tennis shoe should be lightweight, oriented for speed movement and use materials that increase the stability. Different players choose to wear different brand shoes that attribute to their style of play. For instance, the King of Clay Rafael Nadal uses the Nike brand and leading Wimbledon champion Roger Federer also uses Nike. In the women category, the top-earning player Serena from the USA chooses to wear customized from Nike every time. Other leading brands that are Adidas, Wilson, Puma, Reebok, New Balance, K-Swiss, Asics and so on. Every brand releases a wide range of tennis shoes every year. These shoes have got stunning color options and design variations. Each time a brand develops a new model, they ensure to make it better than the previous model. Here are the 10 best tennis shoes in USA that were recently released. 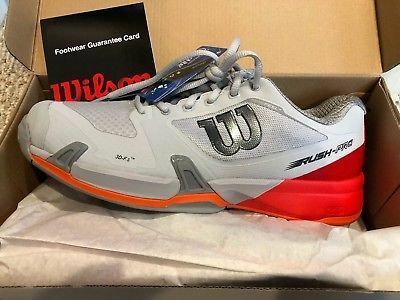 The white and orange combination tennis shoe is a revolutionary design. It has got the all-new 3D FS technology for great flexibility and stability. Rush Pro 2.5 is a lightweight shoe with exceptional comfort. It also has the endo-fit inner lining for absorbing shock. There is a dura-last rubber for the outsole and the thread pattern makes it look opt for tennis courts. The color and design will suit any tennis apparel worn by players.